Quite often you need to add some reference to be able to get some code to compile. This is because the code is referencing some external object that the Excel VBA does not know about. Normally you would add these references through a dialogue, like the example below. If you know the details about a reference you can actually add them programatically. 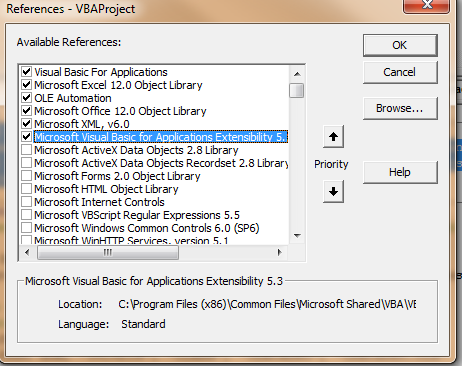 This is useful if you are sharing code that has some reference dependency and is the method that will be used in How to update modules automatically in VBA. In the meantime why not join our forum, follow the blog or follow me on twitter to ensure you get updates when they are available.